SharePoint is currently one of the most widely used office web applications in the world today. In order to make the most of the SharePoint Online program, a company needs to be aware of the seven pillars of SharePoint that can make it easier to get the most out of this program. Here are the seven pillars of SharePoint as discussed by a professional SharePoint consultant. The Could collaboration can be one essential method of sharing the computer files with cloud computing. The documents that are uploaded to the cloud storage from where these files can be used and accessed by others. With the help of this software, your work becomes easy at one end. For accomplishing the targeted tasks, al should have to meet. This software helps business to handle meetings, editing files and transferring files which is done on the effective base. A Cloud Software is an innovative and latest type of software which is based on the Cloud Computing Services. In this service, you can store and upload documents on the central cloud, unless it is accessed by someone. Settings can also change as per the situation so that it can be allowed to use another member to collaborate, comment and upload their own data. Due to its specialties Cloud collaboration has become the choice of several companies. As the files and other documents stored or upload in the central cloud, it helps employees to get work on these files and documents, not matters to send the latest version to every team member. A number of accessed projects can offer employee participation in the higher level. With the help of Cloud collaboration software, the group people get the similar opportunity to input at any time and place. This software benefit team members to modify their work, no matter to be in the same place or a country, it can be done from anywhere and time. Modification and actual time updates can be accessed by all members. The main problem of knowing the new version has been solved by the Cloud collaboration software. Before, most of the email platforms cannot hold the larger files, but when with the Cloud collaboration software, it is possible where it allows space to store large files. The Cloud collaboration can allow many thoughts to be shared and also allow conversations. It has become a supreme way to make conversation smooth and easy among the staff and the managers who initiate the projects with many collaborators. It is being understood now by knowing the benefits of the beneficial Cloud collaboration software, that is essential to hold up the company. 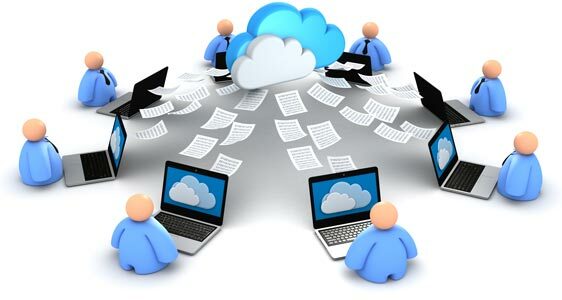 Having the capability of communicating and share documents by means of cloud computing can improve the functioning of work and increase its effectiveness in finishing the projects. The Company is an important element of the Cloud collaboration software, nothing can be accessed without it. The main thing is that everyone should access the equal page. It is necessary to give the task to every team member. Explain them their individual task that’s what they all are going to do. Tell them their limits and expectations of the projects. The work of communication management is very helpful in the method of Cloud computing or having a single application. Thereafter, you will able to invite other participants, track project reports, and discussion.